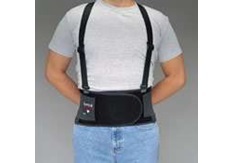 Back support belt with break-a-way suspenders. *Medium - 37" to 40"
Back support belt with break-a-way suspenders. *Large - 41" to 44"
Back support belt with break-a-way suspenders. *X-Large - 45" to 48"